The human body needs a steady volume of blood in order for all of the organs to work properly and for good health to be maintained. When there is a decrease in the volume of blood or in bodily fluids, then a condition called hypovolemia may result. Hypovolemia occurs in stages. At first your nose and mouth may become dry and your urine output may be less frequent. Your heart rate may increase and certain blood vessels may constrict so that the body can maintain appropriate levels of blood flow to your major organs such as your heart, brain and kidneys. 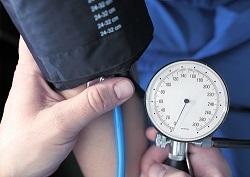 Your blood pressure may also drop. Cold, clammy, or pale skin. Significant decrease in urine output. Blood in the urine, stool, or vomit. Medications to regulate your blood pressure and heart rate. Treatment should also include identifying and stopping the reason for blood or bodily fluid loss. The person seeking damages has a legal right to do so. A medical facility or medical professionals could be liable, for example, if they made a surgical error that resulted in hypovolemia or if they failed to recognize the symptoms of hypovolemia. Hypovolemia is a common—and potentially deadly—type of shock. Accordingly, we encourage you to share this article on Facebook or Twitter to let others know of the risk, and we invite you to start a live chat with us now if you have suffered hypovolemia due to medical negligence.